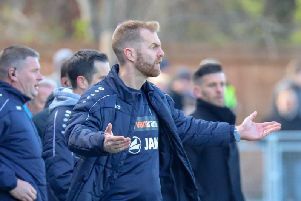 Harrogate Town manager Simon Weaver said his team will be going out “all guns blazing” in an attempt to secure their progress into the quarter-finals of the FA Trophy on Saturday. “I think that this is one of the biggest ties of the round,” Weaver added. “Stockport are absolutely flying and they’re backed by a massive fanbase. “Spring is in sight now and we’re still fighting on two fronts, which is a real positive,” he said. “We are striving to try and keep the excitement levels high for the supporters and everybody connected with the club without putting too much pressure on the players. “We managed to do that last season and we’re hoping to achieve the same again. Without a National League fixture last Saturday due to the progress of scheduled opponents Barnet into the fourth round of the FA Cup, Weaver’s men played a behind-closed-doors friendly with Huddersfield Town under-23s this week. A Town side featuring a number of trialists emerged victorious by a 2-1 scoreline.